Gloucester gets in your blood. Whether it’s the rugged coastline, hidden coves, and beaches, or rich living history, there’s something about this seafaring town at the end of the world that stays with you. Settled in 1623, Gloucester is one of the oldest towns in the U.S. The city rose to prominence as a fishing and seafaring port in the 1700s and to this day maintains a sizable active fleet despite dwindling fisheries and increased catch restrictions. The city’s iconic ​Gloucester Fisherman’s Memorial (known locally as “The Man at the Wheel”) lists the names of more than 5,300 fisherman and sailors lost at sea over the city’s history. Gloucester has long attracted artists of all types to its shores, notably Winslow Homer and Gloucester native Fitz Henry Lane, and its Rocky Neck Art Colony is one of the oldest working art colonies in the country. Countless painters, writers, sculptors, printmakers, and musicians flock to Gloucester yearly, all of them seeking inspiration in its scenery, character, and history. While it may seem that much of Gloucester’s appeal lay in its past, a day here reveals a community very much growing into itself. The steady flow of artists and craftsmen means the city is constantly evolving into something new, even as it remains proudly tied to the sea. Here are my three reasons to take a day trip to Gloucester. Gloucester is home to more boutiques, thrift stores, and unique shops than I can list here, but Lynzariums is a perfect example of Gloucester’s emerging character. Owner and North Shore native Lyndsay Maver offers an eclectic mix of cut flowers, pottery, cacti, and succulents, many arranged into one-of-a-kind terrariums (Lyndsay + terrariums = Lynzariums). “I started putting plants in vessels one day,” she says, “combining different sizes of rocks, sand, and seashells, playing with different textures of succulents and cacti.” She also hosts monthly pop-ups with local artists and chefs. Across the street, check out Vintage 211, quite literally hidden in the lower floor of an old ramshackle building jutting out over the harbor. Inside the space is packed with furniture, clothing, and random odds-and-ends. Want a tweed jacket for $30? This place has 20 of them. Main Street is the city’s primary shopping area, with great thrift stores (the Dress Code and Bananas are local favorites), the Bookstore of Gloucester, Mystery Train Records, and several options for gifts and housewares. The aptly named Bodin Historic Photo is a personal favorite and a great place to catch a glimpse of Gloucester in the old days. Most people hear “Gloucester” and think lobster rolls and fried clams. And yes, you can find those in abundance, but there’s more to the dining scene here than seaside standbys. During the summer, the Market in Gloucester’s Annisquam neighborhood opens its doors and serves some of the finest cuisine in Greater Boston. Founded by two Chez Panisse alums, this tiny, somewhat difficult-to-find restaurant focuses on fresh, local ingredients and simple but elegant preparations. Think wild nettle ravioli with ricotta or Maine ribeye with anchovy butter and fried shoestring potatoes. And the view overlooking Lobster Cove simply can’t be beat. The Market’s sister restaurant, Short and Main, is open year-round and brings that same philosophy to a menu of wood-fired pizzas, antipasti, and a wide assortment of oysters, and its upstairs Birdseye Bar hosts live music and events throughout the year. Duckworth’s Bistrot is ​a local favorite for French classics like duck confit and pork loin au poivre. If lobster is your thing, head just over the border to Rockport to the Lobster Pool, a quintessential lobster shack where you can eat on the rocks (literally: on large rocks) with crashing waves at your feet and the Atlantic stretching to the horizon. One more can’t-miss spot? Try Alexandra’s Bread. Owned and operated by husband-and-wife duo Jon Hardy and Alexandra Rhinelander, this tiny bakeshop cranks out amazing loaves, assorted cookies, and outstanding scones year-round. Go early (or call ahead) and grab a rosemary focaccia or olive baguette still hot from the oven. Perfect if you’re planning a picnic on the beach. One of the best things to do is hit the beach in Gloucester. 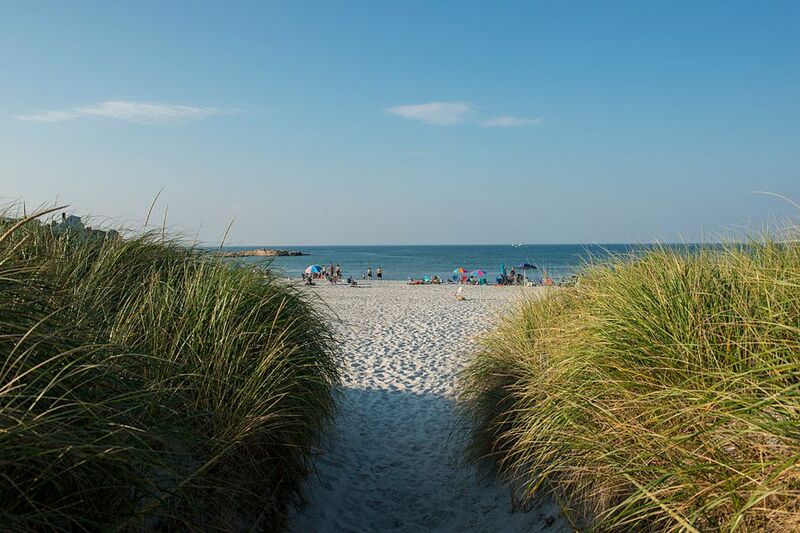 Good Harbor Beach is arguably one of the North Shore of Massachusetts' most beautiful beaches. This beach is ideal for swimming, but of course keep in mind that the ocean is quite cold even in summer months. Make sure you get there early on a hot summer day, as the parking lots will fill up! While Gloucester’s beaches get most of the attention, a hike here brings its own set of rewards. Ravenswood Park includes more than 600 acres of rocky ledge, hemlock groves, and magnolia swamp, with miles of trails and old carriage roads perfect for a stroll or trail run. The Ledge Hill Trail climbs gently through the woods to an overlook with breathtaking long views over Gloucester Harbor, Eastern Point, and the Atlantic beyond. For a scenic and somewhat mysterious walk through Gloucester’s history, head out to Dogtown Common and venture into the woods. Dogtown was one of the earliest settlements in Gloucester and its history is a mix of fact and lore. Witches, vagabonds, and other assorted characters populate its history, and today visitors wandering the trails can still find centuries-old cellar holes from that initial settlement. But the strangest sights are carved boulders bearing inspirations phrases—“Courage,” “If Work Stops Values Decay,” and “Keep Out of Debt,” for example—commissioned by Roger Babson (founder of Babson College) in the 1930s. Oh, and you didn’t hear it from us, but quarry-jumping is a thing that happens in Gloucester.